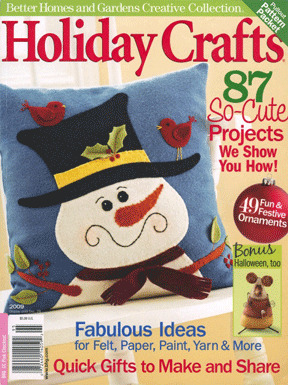 This year's fantastic Holiday Crafts magazine, put out by BHG, is full of adorable and inspiring projects as usual! And of course, there are my wee "snowbabies" on page 68! I made some of these last year as ornaments for my own Christmas tree, and they are so simple to make and so sweet. 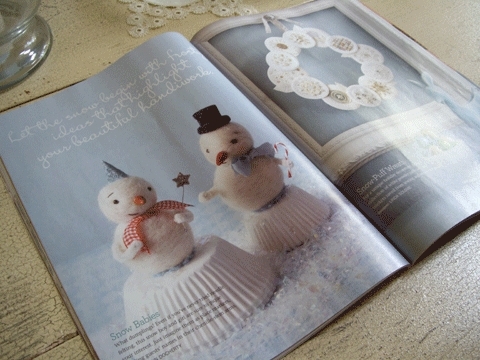 The project on the page next to mine is a wreath made from powder puffs by Linda Solovic. So clever! I love Linda's whimsical work. There are tons of other fantastic artists in here, Magda Trzaski, Johanna Parker, Betz White, Jenny Hernandez, Hillary Lang, just to name a few! Cute, cute, cute. Go buy a copy and get making some fun stuff for the holidays! SUPER cute, Jenn. I’ll def go find the mag. I’m taking a class from Linda S at the Mary Engelbreit workshops next April. I’m SO stoked about it!! Oh, I am so jealous that you are going to the Mary Engelbreit workshop!! I bought it when it came out a few weeks ago and LOVe your little snowfriends! this was a very good issue, one of their better ones I think! Love that magazine:) I bought it to and saw your snowbabies! Love them:) Will you be making any to sell?? Congrats on the article. Hello Jenn….you know I love your work! Thanks so much for featuring me on your blog and praising my wreath. I was thriiled to be across from you on the page…it was a great spread. If you ever want to do a trade…original artwork for original artwork let me know. Love these little characters very sweet!